Ford F150 Forum - Forums and Owners Club > Vendors > Addictive Desert Designs - Ford F150 Accessories - Ford F150 Parts! Addictive Desert Designs - Ford F150 Accessories - Ford F150 Parts! Formerly known as R&H Longtravel, Addictive Desert Designs have been designing and building Off Road Race Trucks for sometime now. We are excited to bring you a product that can give that Off Road Race Truck look and provide the rugged durability you will need in the desert. These Ford Raptor Bumpers have been CAD designed so they mold to the shape of the Raptor and flow with the design. Each Ford Raptor Bumper comes with light tabs, powder coat, and a 1/8 dimple died skid plate. 3/16” skid plates are available for an extra charge. Most of our bumpers can fit up to four 9” lights, which works out great when you’re out in the middle of the desert. 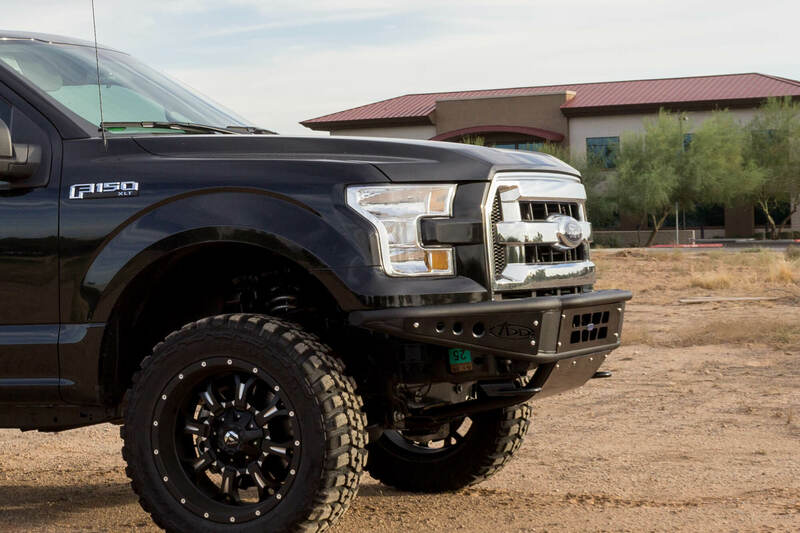 All Ford Raptor Bumpers are custom made in the USA with all American material. For further information, contact Addictive Desert Designs, 1491 S. Conestoga, Apache Junction, AZ 85219, 480-671-0820, www.addictivedesertdesigns.com - Ford F150 Accessories - Ford F150 Parts - Ford F150 Performance - Ford F150 Bumpers! 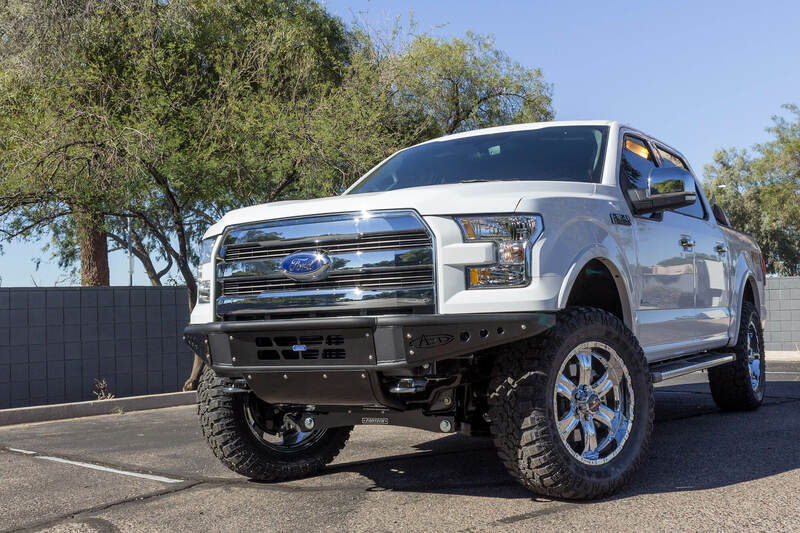 The all new Addictive Desert Designs 2015 F-150 Venom front bumper gives a close to stock profile but demands the off-road attention! The Venom bumper follows factory lines to keep the OE look but also allows for it to have better clearance and protection on and off-road! This bumpers narrow width design allows for a great approach angle for any obstacles you may encounter. It is made of American steel and features an aircraft grade aluminum panels and skid plate. The side panels hide mounts for one Pod/Dually type light each. 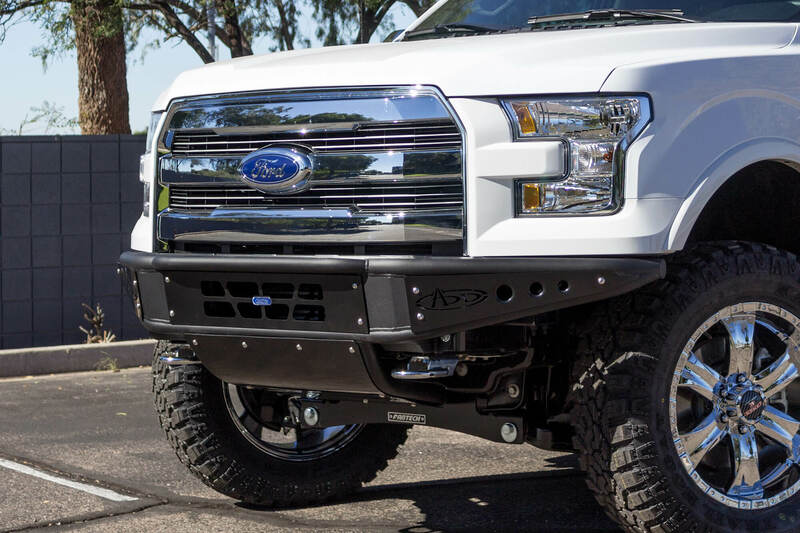 There are also holes on a small plate behind the front bump/step tube, giving options on the bumper for three bottom post mounted lights like Rigid Duallys or one 20” bar with an added light mount kit. The bumper comes in hammer black with a gloss skid plate and side panels.